Les Rosiers : Diving conditions :exposed site , strong current , dive only in good weather conditions. For experienced divers. 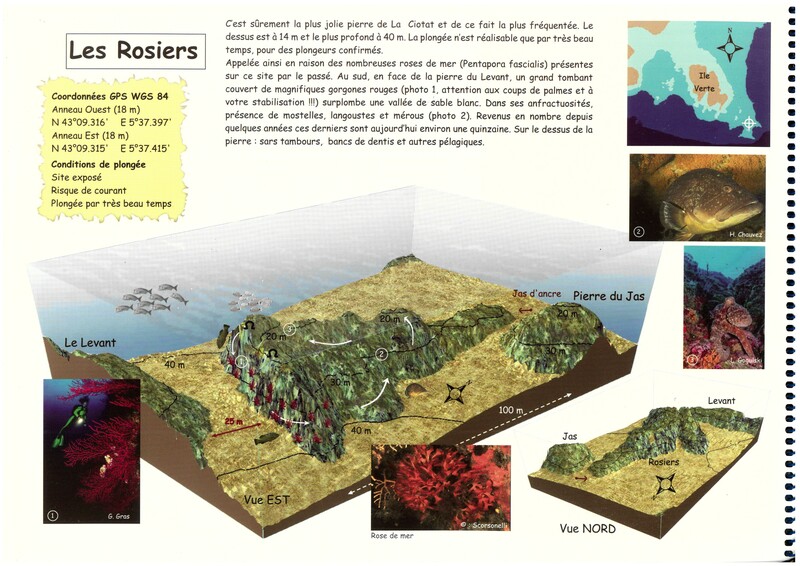 It is probably the most beautiful stone of La Ciotat and most frequented diving site.Its top lies at 14 meters down to 40 m (131 ft).In the south , opposite the « pierre du levant »,you will find a huge drop-off covered with magnificent red gorgonians (photo 1).Mind your fins’strokes and manage your buoyancy.Forkbeards , lobsters and groupers can be found into its crevices (see photo 2).Above the stone , big lips breams , dentis and other pelagic fish.